Is Dehydrated Food a good idea for a Dog? Dog Food Guide > Dog Food > Is Dehydrated Food a good idea for a Dog? Dehydrated dog foods (also called “raw dehydrated” foods) are actually dry dog foods, though they are not produced the same way as most kibbles. The moisture in the food is removed using a drying process. The food is lightly cooked as it dries, though not for very long and not at a high temperature. But this light cooking process is enough to alter the cellular structure of the food (meats, vegetables, fruits). This form of processing can preserve the nutrients in the food better than in foods cooked at high temperatures such as kibble or canned foods. 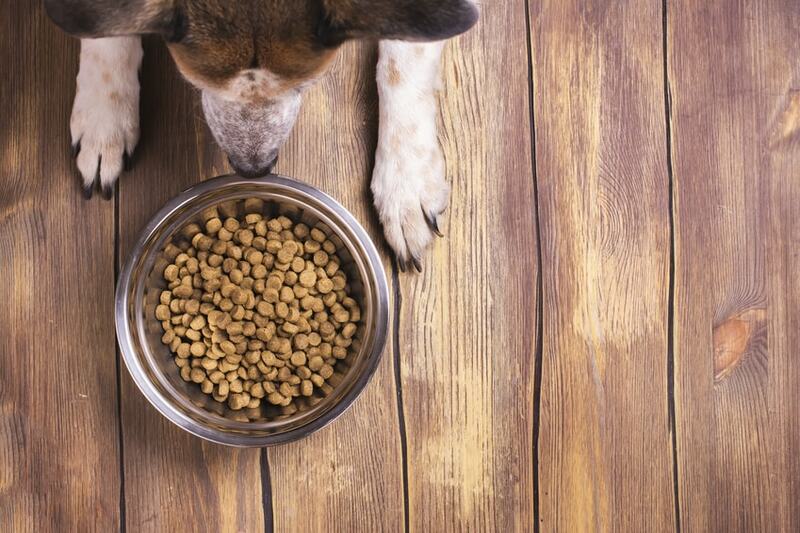 Dehydrated dog food has a number of benefits and it is growing in popularity. By many accounts, dehydration is an ancient way to preserve food, though we use machinery to do it now. The ingredients usually start off raw and since they lose fewer nutrients though dehydration than in highly processed dog foods, the food may be healthier for your dog to eat. Since the food has had much of the moisture removed, it does not spoil easily. These foods usually have a long shelf-life and they don’t require the preservatives that kibbles require. Dehydrated foods are easy to prepare. In many cases you just add warm water to rehydrate the food before feeding it to your dog. With other foods, you can add additional meat to the dehydrated food. Many dehydrated foods are made by companies with very good reputations. These companies use high quality ingredients. ZiwiPeak is an example. They call their dehydration process “air drying.” They use human grade, free-range, antibiotic-free, hormone-free meats; and their foods are grain free, mostly meat-based, with few or no carbohydrates. The Honest Kitchen is another well-known brand that features human grade dehydrated products. They have both complete meals and base mixes so you can add your own foods to the diets. They have a wide selection of diets including grain free and meals with grains. You can also try samples of their foods for a modest price. Another benefit of dehydrated dog foods is that a little goes a long ways. With the moisture removed from the food, the food doesn’t take up much space. But when you rehydrate, the food expands. The Honest Kitchen has a nice page showing you how 10 pounds of their food makes 40 pounds when you rehydrate it. Dehydrated food does seem expensive when you compare it to kibble but you have to adjust the cost according to how much food it will make once it is rehydrated. In many cases you will feed your dog less food when you are feeding a dehydrated dog food. Dehydrated food is also easy to carry and store. And it does not require any freezing or special care before you are ready to use it. There is some consumer confusion between dehydrated dog food and freeze-drying. The freeze-dried process is different from the dehydration process, though it also removes moisture from the food. In freeze-drying the food is frozen and then the surrounding air pressure is lowered to encourage the moisture in the food to evaporate. Freeze-drying causes less damage to the food but there can be some other effects. While it is a little confusing to consumers, retailers often lump dehydrated dog foods and freeze-dried foods together, as Chewy.com does here. We place freeze-dried foods with raw frozen foods. I and Love and You , Addiction, and Wellness CORE Air-Dried foods are other good brands of dehydrated foods. One criticism of dehydrated dog food diets – even those with complete meals, but especially pre-mixes – is that when tested by outside sources, they do not always seem to provide a complete and balanced diet. This could be because dog owners do not follow the directions correctly when it comes to mixing the meals. If you are supposed to add any supplements or meat to the meals, make sure that you do. If the directions advise against adding supplements, follow the directions. If your dog fails to thrive on one of these diets, by all means, change the diet to something that suits him better.